Elon Musk at LZ-1 standing next to one of the two Falcon Heavy side boosters. Everyday Astronaut (Tim Dodd) has posted his 360 degree video of his experience three miles away from the Falcon Heavy launch. He is standing exactly where I was at the final Saturn V launch of Skylab. This is very nostalgic for me and I understand the emotions he must have been feeling. Tim is doing a fantastic job covering SpaceX and spaceflight in general. His videos are simultaneously highly informative – and – entertaining! His enthusiasm is contagious. Please check out Tim’s home page (https://everydayastronaut.com) and his YouTube channel. 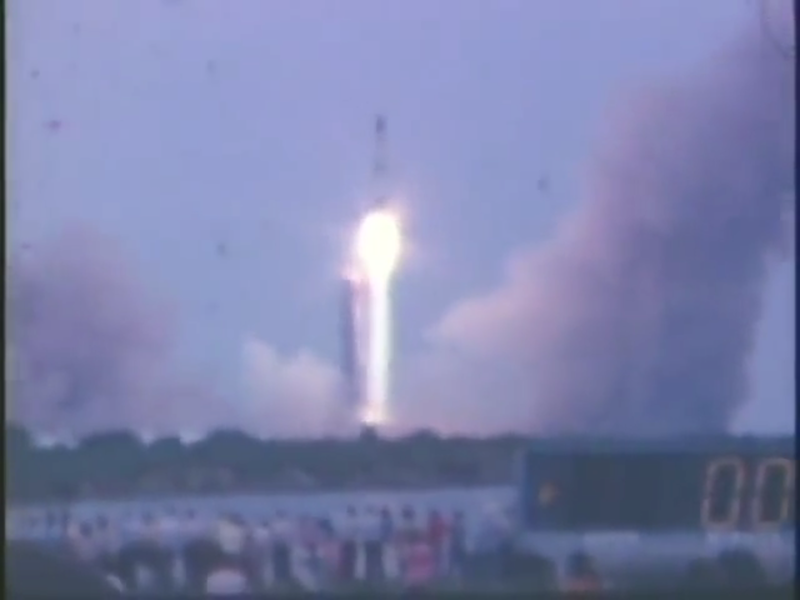 If you have not already done so, check out A Blast (off) From My Past for an accounting of my experience at the Saturn V launch, some 45 years ago. * I tried to embed the video, but WordPress and/or iOS Safari wouldn’t support 360 in the embedded version. Unless you have been living under a rock, you now know that yesterday SpaceX accomplished something spectacular. That being the launch and partially successful landing of the Falcon Heavy boosters and the delivery of “Starman” in Elon Musk’s vintage cherry red Tesla Roadster. Both side boosters landed successfully back at the Cape as shown below. Unfortunately the core section failed to initiate the final landing burn and crashed next to the recovery drone ship. YouTube, Reddit, and Twitter are replete with coverage and discussion. I have selected a few choice (short) videos below for your enjoyments. Note that even though the bottom videos from the returning side boosters shown above are supposed to be from each individual booster, someone goofed and we see the same video stream displayed on the left and right. SpaceX corrected this with a later video, but that is not currently available on YouTube. Let the New Space Race begin! The image below is a screen capture from one the videos in the previous post on today’s SpaceX CRS-10 launch. Life comes full circle. In a much earlier post I described what it was like to be standing at the water’s edge in the foreground at the last ever Saturn V launch. The Saturn V F1 engines were the most powerful rocket engines ever made. Each one produced over 1.5 million pounds of thrust. The five F1 engines on the Saturn V made it the most powerful launch vehicle ever at over 7.6 million pounds of thrust. Just over forty years ago on May 14, 1973 [almost 44 years as of this writing], I was lucky enough to be among the press and dignitaries sitting on the bleachers or standing in front of the turning basin at the Launch Complex 39 Press Site for the last ever Saturn V launch. I was 19 years old. My best friend’s aunt was a professional photographer. She got each of us a press pass for the launch of the Skylab space station. 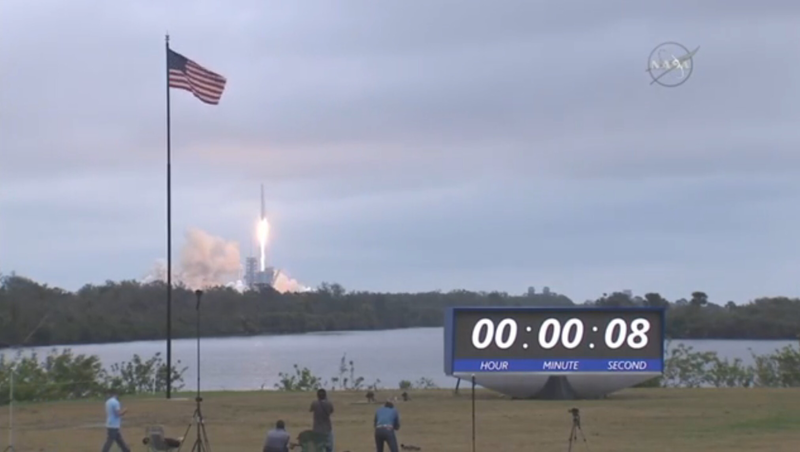 For a teenage space fan, who had watched every manned launch since Alan Shepard’s first suborbital Mercury launch, this was truly “dying and going to heaven”. For several days before the launch we got to go on exclusive tours of the launch site. We were able to see Walter Cronkite’s broadcast booth. NASA loaded us up with press packets and thick tomes of specifications. I can not begin to tell you how totally cool this was. On launch day I was one of the throng of people standing to the left of the countdown clock in the picture above. I was just three miles away from the launch pad. When the engines fired up, the sound of the F1 engines was felt as much as heard. The low base rumbling seemed to reach directly into my chest and vibrate my heart and lungs [dare I say it was nearly orgasmic?]. As the Saturn V rose into the sky, I could smell the burned kerosene of the exhaust as I felt the waves of warm air wafting over me. This was truly a once in a lifetime opportunity. The SpaceX image inspired me to search the Internet and YouTube for Skylab launch images. I scored big time. The second image is screen shot from the video below. Back in the day I had a fetish for white jeans (probably expressing my inner John Lennon). Trust me – I am in there somewhere. The Internet is amazing. Welcome to the future. Reminds me of the days of the Apollo launches. A preview of today’s scheduled launch (Tuesday, Feb. 6th at 1:30 PM ET).